The boat is documented to having been completed on the 15th of May 1992. The first measuring certificate was then issued on the 27th of May 1992. Any additional papers about the boat for the document section of this file will be most welcome. About measurement as 5.5 S.I. in 1992 no doubts but… before? Is it viewable? 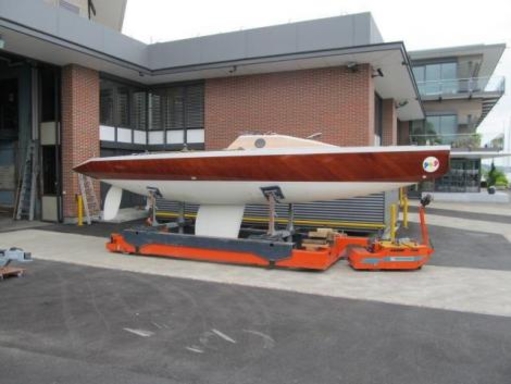 The Portier boatyard has reconfirmed, that 5.5 SUI 179 was built to the 5.5m Rule, the M.C. in the document section has all relevant details. The deckshouse & engine came later. The boat was built using wood laminate. Please are you sure Pio IX was originally built as 5.5? Is it a wooden hull? The "PO9" was built as a 5.5m racer and later converted for cruising, hence today featuring a small deckhouse, benches and an engine.